Rebranding is difficult for an artist of any size, but the possibilities that can arise are limitless. Achieving a good deal of success under the WHITEHORSE banner (she was able to rock giant crowds at Coachella on the Do Lab stage, as well as at LiB and at the El Rey in LA), this year Natalia Benson chose to birth the NINTH CHILD project. Shifting gears to a future bass oriented sound, Benson was able to channel all the provocative energy of her spoken word stylings, and evoke a more nuanced vibe than her groove-heavy prior alias. Today, NINTH CHILD debuts the seductive "Together Apart" video, which pairs her with an equally fiery partner as they shift through the various stages of any intense relationship; lust, love, jealousy, betrayal, forgiveness--it's all in there in a matter of minutes. The cloying, pleading bass lines echo the tumultuous on-screen romance, and stand-in for the words that cannot be spoken. You can catch Benson and her new persona as part of Grateful Generation's A-Bun-Dance pre-Burning Man White Out party this Thursday, August 11th, at LURE in Hollywood. 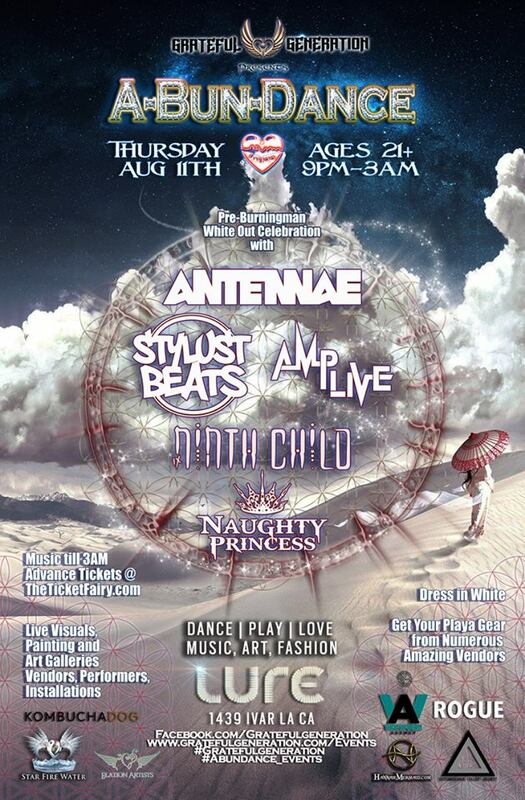 NINTH CHILD will be joined by An-ten-nae, Stylust Beats, Amp Live, and so many more, as freaks and faeries of shapes and sizes will descend on scene in all manner of white regalia. This Bohemian Bazaar brings art, music, and fashion together under one roof, and yes, it's a great place to get decked out before the Burn with the best vendors in Los Angeles. Get your tickets, because they are going fast.